A dental implant is an alternative to conventional crown and bridge placements. It also serves as an anchor for dentures or stands alone as a single implant and cap. Dental implants are placed into the jaw, beneath the gum line, where they remain permanently. Dental implants are an aesthetically pleasing answer to missing teeth. Dental implants consist of two parts. The first part consists of a titanium screw, set into your jaw. It sits below the gum line, level with the roots of your teeth. Due to the nature of titanium, the screw eventually fuses with your jaw. In this way, it becomes just as connected to your jaw as the natural roots of your teeth; in some cases, even more so. The screw is then covered with a topping. The material used to top your dental implant depends on its purpose. If your dental implant is made to stand alone, it will have a dental cap on it. However, if it is made to be part of a bridge, it will have that part on top. 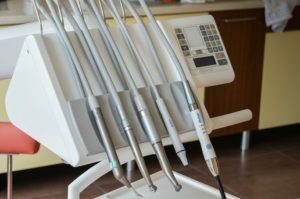 Lastly, if your dental implant serves to anchor dentures, a connector will be placed on top. If you have dentures or crowns then you might want to consider dental implants as an aid to these. For example, dental implants positively impact the stability of dentures and crowns. Unfortunately, dentures do not always have a solid place in the mouth. Moreover, if your mouth has little ridge definition on the palate and gums, it can be difficult to keep dentures in place. This often makes simple tasks like eating and speaking both difficult and embarrassing. Fortunately, a dental implant can be used to anchor dentures in the proper place. The connector on the head of the implant slides into a slot on the bottom of the dentures. This prevents the dentures from sliding around while speaking or eating. As an added bonus, it also helps prevent mouth blisters and sores. In the same way, dental implants also aid in anchoring bridges. A dental bridge is used to cover a missing tooth or missing teeth. Instead of leaving the bridge unsupported, a dental implant can be placed in the area of the missing tooth. The bridge is then placed over it. When you bite down on the bridge, the stress is transferred through the dental implant and into the jaw. Thankfully, this drastically lowers the odds of breaking your bridge. Who is a good fit for a dental implant? The perfect patient for a dental implant is narrowed down with a few specifics. These specifics require that the patient is a non-smoker without diabetes or any similar diseases, as these often slow down the healing process. Other requirements include having enough bone mass in the jaw to support the implant, a fully-grown jaw, and healthy gums. The most important thing the perfect patient for a dental implant possesses, however, is dedication. Dental implants need to be properly cared for. This requires regular brushing and flossing, as it’s easy for an infection to spread into the gums and your jawbone. If you’re not confident in your ability to care for your dental implant properly, you should not get one. A dental implant can make a world of difference to the stability and comfort of dentures and bridges. It can be used on its own to fill in single gaps in teeth. While dental implants provide many benefits, they require proper care. If you’re a non-smoker with a healthy jaw and commitment to caring for your dental implant permanently, then a dental implant might be the perfect fit for you. Contact our office today to schedule an appointment and discuss your options.